The past few weeks have been fairly laid back after the Jedburgh race and we managed to arrange a weeks holiday up in the Highlands last week to really get a chance to unwind. It was a perfect short break in an exceptional place I found on the internet. It’s one of those place that, when you find it, you don’t really want to share it in case everyone starts to go. However, it’s so bloody good that I won’t be able to not talk about it, so here it is: Eagle Brae. More about that in a moment. Staying there gave me the chance to get in a few longish runs in some epic locations and most of all, broke my training regime from a rigorous focused approach (I’m laughing to myself writing that), to simply getting out and enjoying my running again; and it worked. Now a bit about Eagle Brae. It is a place which as soon as you start to learn about it, it makes you wish that it was you who’d come up with the idea. It achieves that nirvana of situations, combining a lifestyle with a business. The owners, Mike and Pawana (pronounced Pubna), are a really nice couple who deserve the success their business is achieving through the hard work they have put into it. It has apparently taken them 8 years to convert a plot of land on a bracken covered steep highland glenside into a luxurious, eco-friendly range of log-cabins, the likes of which this country has never seen. This is no Center Parcs folks, think 5 star hotel made out of giant Canadian logs with cashmere tartan blankets. I love the place for so many reasons, the location, how they’ve designed the site so nobody overlooks anyone else, the furnishings inside the cabins and that they recognise the type of folk who are likely to go there want fast internet access and help at the end of a telephone when they need an extra bottle of wine of an evening. From a business perspective, I imagine they are probably one of the few enterprises in the area that are drawing some spectacular incomes. It must be hard making a living in remote places like that, but I suspect the effort and investments they have made are paying off handsomely. To say I’m envious would be an understatement, but they are also inspiring for me in terms of what can be achieved with dedication, hard work and, most importantly I think, a great vision. The area itself is a part of Scotland I’ve never visited, only passed through on the way to other parts. I now wish I’d paid more attention and found my way there sooner. Being on the north side of the Great Glen, it is remote and wild terrain in abundance. The particular area where we stayed was Strathglass, which is a long meandering river valley, off of which turn handsome glens. 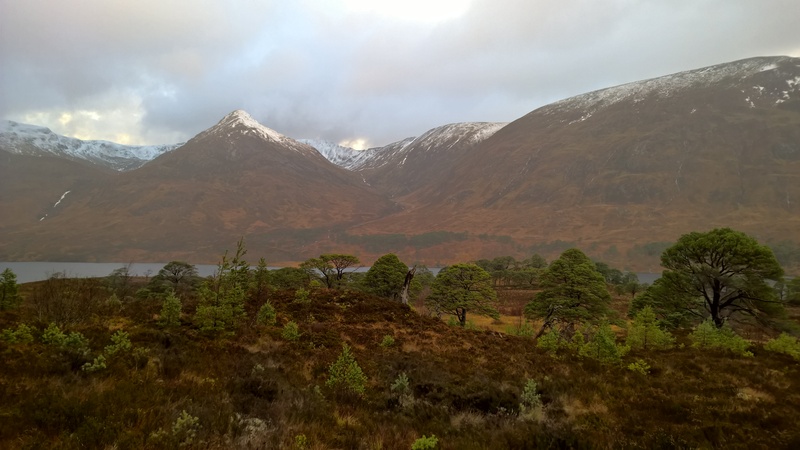 I explored two during a couple of runs: Glen Strathfarrar which has some increasingly spectacular hills the deeper you go and Glen Affric which I now feel is the most beautiful place I’ve ever been to. After studying Walk Highlands for a number of hours on our first day, I eventually worked out that Glen Strathfarrar was about a mile away from where we were. The MWIS forecast for the area was grim so I opted for a 16km horseshoe route which took in a couple of Corbetts rather than the more remote and exposed Munros in the area. These Corbetts still looked to provide a challenge, but without the high exposure which would attract the fierce winds and snow that was predicted above 800m for the day. Or so I thought. Having only been running for just over a year, I had a winter season last year, but didn’t really get to adventure into areas with too much exposure. during the summer I’ve had a chance to get out and about up high, but winter gives the mountains a different experience altogether and this run was just what I needed to remind me. The route started off up a secluded track before breaking out across open moorland and grouse butts. We had seen some significant rainfall during the previous week and consequently the open ground was saturated and any stalkers path was like a river. Within minutes my feet were sodden and I gave up trying to keep them dry. As I climbed above 600m the wind blew and it started to snow. The summit of the first hill, Beinn Bha’ach Ard, was exposed and as I reached it the wind was pushing me sideways. I dressed in everything I had and kept going past the trig point to get in the lee side and away from the wind and on to the next hill, Sgurr a’ Phollain. From here it was a game of find a path, any path, in a long loop back to where I parked the car. It was beautiful country to run in. Later in the week the weather up high was again threatening to blow your skin off, so another venture to Walk Highlands turned up an 18km loop around a loch I’d never heard of before. Whilst I might not have heard about it before, I will certainly never forget it again. Loch Affric and the glen from which it is named, is simply the most beautiful place I’ve ever been to. The route started and finished in a forestry carpark which, on this wintery, wet and blustery day was deserted when I arrived. Great! I have the place to myself. The route seemed simple enough, set off along the northern shore of the loch along a well laid path, cross a burn about half way along, loop around the far end of the loch and enjoy the run back to the car. There were two problems with that route. The first, and a nice problem to have, was that the place was so scenic, I kept feeling the need to stop every few minutes to take another picture. The second, and not so nice problem, was that burn I mentioned. In the guide it suggested there would be stepping stones to make it easier to cross. Indeed there were, I could see how they were creating turbulence in the torrent that was raging over them! The burn crossing turned into more of a river fording. Despite having to wade waist deep through freezing cold fast flowing water, I was still smiling at the end of the loop. At the far end of the loch the path meets another, the Affric-Kintail way, which heads off into the remote glen you can see further along. This apparently leads to the most remote youth hostel in the country and it looked a foreboding place. I looked up the Affric-Kintail way when I got back. It looks like it would make a great route for an ultra marathon! Anyone fancy joining me in creating a race there? There is also a bothy at the end of the loch which I found being refurbished by a couple of guys. I took some time to have a chat with them and I still don’t know if they have the best or worst job in the world given the landscape they worked in. Given how cold it was though, I suspect the view wears off after a while. Maybe. We are back from the short break now and we have snow finally covering the Lomond hills by where we live. Tonight’s run reminded me why I love running here in winter. I’ll leave you with some wonderful pictures from my run tonight.